The majority of cruise ships dock at the larger of our two piers, the B-Street Pier & Cruise Ship Terminal, located at 1140 North Harbor Drive. It is situated on the Big Bay® in downtown San Diego, within ten minutes of the San Diego International Airport and the train terminal, with easy access to an Amtrak station. Our second terminal, the Port Pavilion on Broadway Pier, is a venue for special events and public waterfront access, with a restaurant, a visitor center and a public plaza. With your cruise departing from San Diego, you'll find a variety of packages that offer everything from pre- and post-cruise tours of the city to complimentary hotel shuttles and complimentary airport shuttles. - There are more than 19 beaches in San Diego, including Mission Beach, San Onofre State Beach and Ocean Beach. – approximately $12-$15 from SAN airport to the cruise ship pier. Due its close proximity to the cruise port, taxis are a main source of transportation. The signs to the Transportation Plaza are clearly marked where taxis are readily available. At the airport, follow the signs for Ground Transportation. If you’d rather ride in luxury, consider a private transfer to take you from the airport to your hotel. Plan for traffic delays along North Harbor Drive. Before you leave for the terminal, check the port's website. The site features travel advisory details, including details on where your particular ship will be berthed. SANDAG and the San Diego Transportation Partners provide real-time traffic information with driving times and incident reports, transit routes, fares, carpool and vanpool information from this website: http://www.511sd.com. Additionally, the San Diego International Airport (SAN), at http://www.san.org, offers real-time flight information, as well as additional parking and transportation options. SAN is less than 10 minutes’ drive from our cruise ship terminals, approximately two miles north. Once you reach the Port of San Diego, you will enjoy the use of wheelchair accessible elevators and a passenger gangway, along with a variety of other helpful amenities. The terminal employs a number of customer service representatives. If you need any type of assistance, head for the service desk. The Port of San Diego offers a 30,000-square-foot main cruise ship terminal building. You'll find two additional structures for passenger reception and baggage handling, totaling an additional 15,000 square feet. There are also two warehouse areas at the port. You are required to arrive an hour or more before departure. You may drive onto the pier, but be prepared to present a photo ID and a ship ticket for your date of arrival. Make sure all luggage (even your carry-on) is labeled with your name, your home address , and your ship stateroom number. The porters at the pier will take your luggage and it will be delivered to your room. Be sure to tip the porters at least $2 per bag. - If arriving by car, you may be driven onto the B-Street pier for drop-off. - You will be required to show government issued passport and a ship ticket for that date in order to access the pier and enter the cruise ship terminal. - Once you pass security, you will need to check-in at your cruise ship counter. - Your passport and ship ticket must be shown for check-in and at the gangway in order to board the ship. 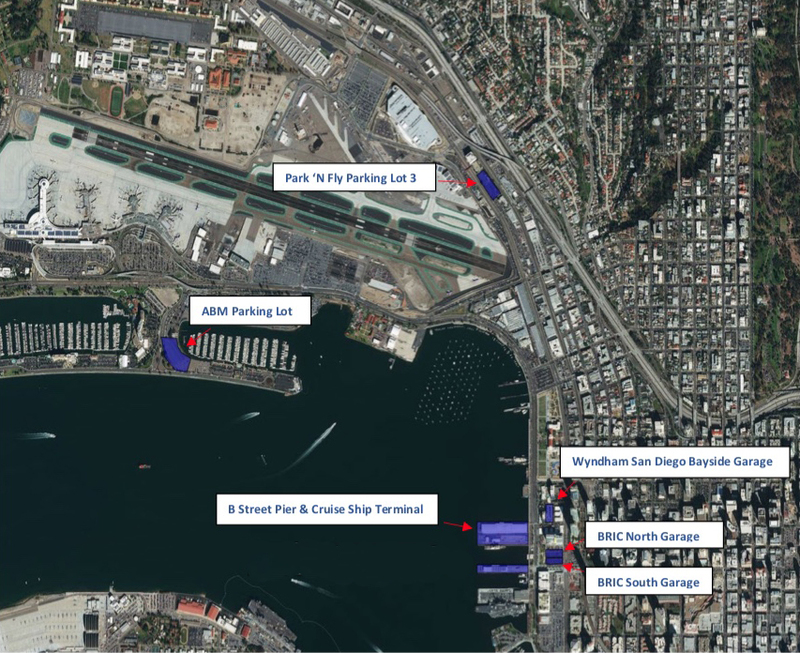 The Embarcadero and nearby areas offer plenty of options for paid parking during your cruise. Please note that passengers may not park on the pier during their cruise. Open 24/7 - The the ideal location for any destination out of the Port of San Diego. With convenient shuttle pickup to and from the cruise ports, you can rely on Park 'N Fly for all of your port parking needs. Park ‘N Fly is proud to offer a 10% Military discount to Active and Retired Duty members. Discount can be applied upon exit at drive-up at all Park ‘N Fly locations. A 10% discount can be applied online or upon exit at drive-up for current AAA members at all Park ‘N Fly locations. Open: 24/7 – Long Term Parking and Cruise Parking available at this location. See posted rates. No shuttle - must use taxi or ride share to/from the cruise terminal. There are wheelchair accessible elevators and a passenger gangway. Customer service representatives are available to help if there are any special needs. - In parking spaces with the International Symbol of Access (wheelchair symbol). - Next to a blue curb authorized for handicapped parking. - Next to a green curb (green curb indicate limited time parking), no more than seventy-two (72) consecutive hours. - At on-street metered parking space. - In spaces marked with a crosshatched pattern next to a parking space with the International Symbol of Access (wheelchair symbol). These spaces are for wheelchair and wheelchair lift access. - Next to red curbs, which indicate no stopping, standing, or parking. - Next to yellow curbs, which are for commercial vehicles to load and unload passengers or freight. - Next to white curbs, which are for loading and unloading passengers or depositing mail in an adjacent mailbox. Disabled parking spaces are available in all off-street parking lots and garages. However, patrons who choose to park in these facilities are obligated to pay any applicable parking rates. This applies to both private and public off-street parking garages and parking lots. California Vehicle Code privileges for free parking with a disabled placards and license plates only apply to on-street parking. For privately owned off-street garages and parking lots which do not charge fees, vehicles with disabled placards must abide by any posted ordinances or restrictions for those facilities. Vehicles are not allowed to park for more than Seventy-Two (72) consecutive hours. This Seventy-Two (72) hour limitation applies to any street, parking lot or parking area within the San Diego Unified Port District's jurisdiction, regardless of any other posted parking designations and/or restrictions (San Diego Unified Port Code Section 8.16).